Can you remember when your love affair for motorcycles began? 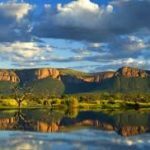 We often forget how much our beautiful country has to offer, this story will inspire you to start planning your next epic trip with us. Day 1: ‪‪#‎BikeRentalsZA‬‬ Departed the train in Cradock, and made our way to Die Ou Pastorie, where we geared up and then moved on to a scrumptious breakfast at True Living. Thereafter traversed through wide open Karoo roads and the Swaershoek, Soutpansnek, Swanepoelspoort, Naroegaspoort and Trompetterspoort Passes. Sometimes terrifying speeds for a novice like me, but nothing that a seasoned rider like Danny Mulder and his Yamaha XT 1200ZE Super Ténéré couldn’t handle – with aplomb!! We rode through Pearson and had lunch at the Lavender Cafe in Jansenville. The dry Sundays River was a sad site to behold – the lovely homesteads and buildings a delight! Finally arrived at our destination – Willamore, A magnificent town with yet more beautiful old buildings, steeped in history. Staying over in The Historical Willow Hotel. Tired, euphoric, safe and happy!! The start of our descent to Die Hel. Day 2: Today I went to Die Hel and back! It all started off in the most glorious manner, and then the inevitable happened!! We left The Willow Historical Hotel, with the promise of 375km ahead of us. Shortly after we left, we experienced a few hiccups with the knoblies- the off-road tires – on the wet tar. 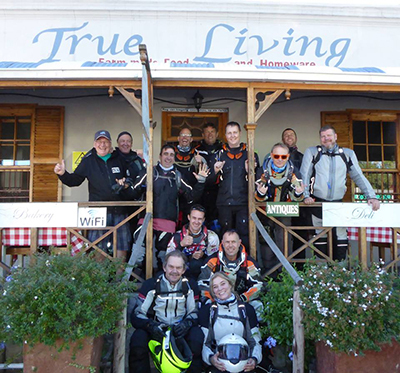 As a result, the KTM chaps felt rather insecure, but found solace with a cup of coffee, and the orange background of the African Aloe Cafe in Uniondale. 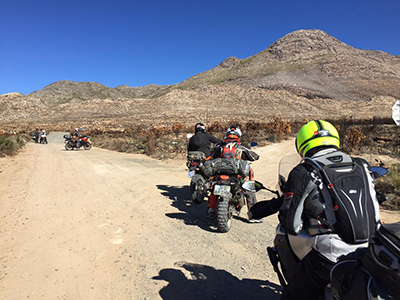 We then continued as planned, riding through the towns of Buffelsdrift, Daskop, Koutjie, De Rust, and lunch in the most beautiful town in South Africa – Prince Albert. How easily we forget the spectacular aspects of South Africa!! We rode through the most magnificent passes en route; Buyspoort, Ghwarriespoort, Potjiesberg, Die Kamanassie Rivier Pad, Meiringspoort, and the Kareedouwberg Passes. Meiringspoort Pass, splendid in a car, was just spectacular on a bike!! A Banting Burger at the Swartberg Hotel in Prince Albert added to my feeling of euphoria! Soaring Eagles, magnificent mountains, the warmth of the people, a nation that shan’t lose hope! I fear that my command of the English language, and that of my iPhone 6 cannot give justice to our glorious South Africa. And then Die Hel!! Initially the road was terrible – full of rocks, pebbles and sand. But at least it was in the valley; after about 20km the structure of the road improved marginally, thankfully, as we had left the valley, and were traversing along the edge of reason!! The sheer drops literally took my breath away!! Hair-raising cannot begin to describe the experience; Hair Pin Bends however, have never been as terrifyingly accurate!! My recurring thought was ‘we have to come back out on this road! !’ Every time I thought that nothing could be worse, we came across another scary vista!! Danny Mulder and his Yamaha Ténéré were at one with each other!! Man and machine were so in tune with one another; Danny was incredible! With a novice pillion such as I, he managed to get us to hell and back in one piece! I have chosen well! Eventually we emerged unscathed from Die Hel, but we still had to get down the mountain!!! One wrong ‘step’ doesn’t bare thinking about. Day 3: The 3rd leg of our trip started off in heaven! We had breakfast in the most gracious setting at the Swartberg Manor Guesthouse. The day ahead is set to be a gentle 310km in comparison to yesterday. 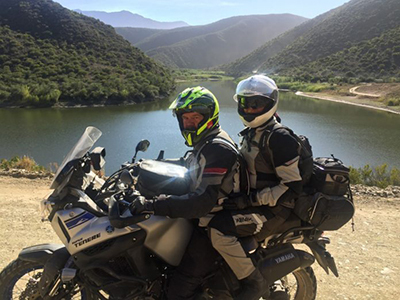 We rode out the hotel, and followed the road along the valley with the majestic Swartberg Mountains to our right – a constant comfort knowing that Die Hel was behind them; done and dusted!! We all decided that the valley road of Huis Se Hoogte Pass is probably the prettiest road that we have ridden on in South Africa. 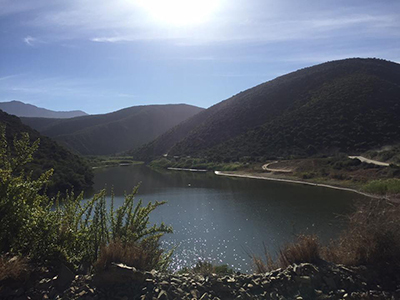 We passed the Swartberg Private Wildlife Estate and were fortunate enough to see Giraffe, Lechwe, a little baby Rabbit and a Fish Eagle!! We rode along the winding road close to the river, passing fields of Olive Trees resplendent in front of Cape Dutch Homesteads. And then a few vineyards completed the idyllic Cape landscape, passing through the Kruisrivierpoort Pass before popping out in Calitzdorp. We filled up with petrol in Calitzdorp and then carried on through the Rooiberg Pass. A few unexpected surprises as the initial bit of the pass was steep, very rocky and sandy. The rocky ascents, steep inclines and 90 degree bends were actually more technical than Die Hel, but fortunately only in short spurts. Far more technical than expected. Further along a huge mudpatch was conquered, as well as a stoney empty river bed of about 100m full of round boulders; Robin told us that these Oudshoorn conglomerates are ancient seabeds formed over a 130 million years ago; boulders and pebbles cemented together in the geological formations by oxidized iron rich soils. Further along, the shale looked beautiful as it caught the sun, making the hills look as if they had been sprinkled with glitter. We passed through Lower Oudtshoorn, and stopped for lunch at Holgate Food Stall on the side of the N12 for a scrumptious (non-banting!!) burger. Their mince vetkoek was also a firm favourite!! We then rode through Herold, and down the Montague Pass with its steep declines, rutted surface and motorists and cyclists to boot!! The road was no longer ours!! But what a lovely pass. My visor was open to take in the intoxicating fragrance of the Fynbos, Eucalyptus trees and the clumps of proteas. Suddenly, through the mountains, my first glimpse of the ocean, which never fails to excite me!! Taking me back to my childhood, with promises of Smarties to the first one who spotted the sea!! Riding through George, we turned left onto the Old George-Knysna Road, and continued through the 7 Passes; Zwartrivierhoogte, Kaimansgat, Silverrivier, Hoogektaal, Karatara, Homtini and Phantom Passes. 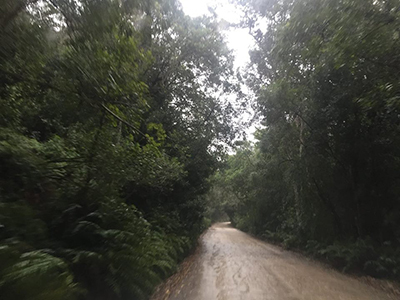 What a way to travel between George and Knysna – silent and gentle with the thought of sighting a Knysna Elephant never far from one’s mind. The moss, ferns, brown streams and forests were a sight and olfactory sensation to behold! 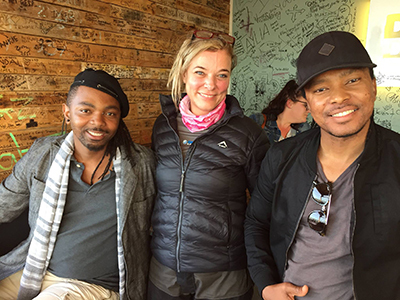 Arriving in Knysna, we all settled down to a drink or two… and a delicious meal at Greenfire lodge. Exhausted from the previous late night and extensive riding. Thursday is our day off. A day to relax and take in the sights of yet another magnificent town in South Africa- Knysna! Andrew Biram, your planning has been brilliant. Your routes captivating, enthralling and vigorous! Thank you!! 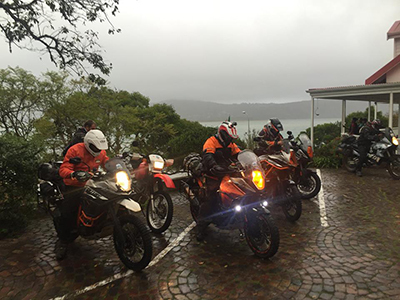 Day 5: The 4th leg of our trip started on a cold, windy and wet morning in Knysna. We woke up to the cold front that friends and family had warned us about. Due to the technical route we were about to embark on, and the fact that the rain would make it even more treacherous, I decided on the safer option – both for Danny and I; I slummed it in the Range Rover for the next 370 or so kilometres. We left Knysna in the rain, and followed the road to Uniondale – passing through the spectacular Prince Alfred’s Pass. This Pass – as with many of the passes we rode through – was built by Thomas Bain, and is probably his greatest work. Beautiful scenery, magnificent fauna and misty mountains. The muddiness of the roads confirmed that choosing to drive in the Range Rover with Martin was probably the right thing to do. I did not envy the guys as I watched them slide through those corners. We arrived at Angies G Spot; the guys had to find it! They were wet and miserable and a hot cup of coffee after a shot of sherry really did hit that spot!! They were so wet that when they clenched their gloved hands, water poured from them. The short stint at the spot though, would not dry the gloves, helmets and jackets out enough. We looked all over for spare Linex Yamaha comfies, and they were so desperate to find protection from the rain, that they asked Angie for plastic garbage bags which they used as additional barriers to the rain until we found something more appropriate in Uniondale – a boer maak n plan!!. Nothing could discourage these Adventure guys though!! So off we went, through more spectacular panoramas which we could barely see, due to the mist. I tried to take as many photos of the beautiful ever-changing vegetation. We filled up with petrol and booze in Uniondale, as there is no licence at Oom Piets place in the Baviaanskloof. 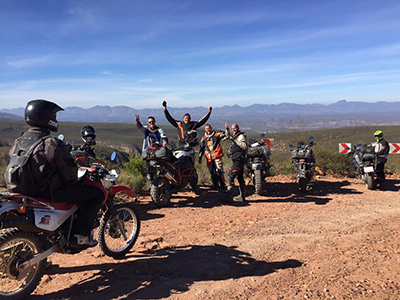 We had lunch again at the orange cafe – KTM chaps need as little change as possible, and then carried on to the even more serious technical turns and slippery rocks in the rain – Baviaans Kloof. Another Thomas Bain masterpiece, started in 1885. It was the last of the 24 passes he built, and the longest. The first section comprised 73 miles from Willomore to Keerom, and was completed in 1890. 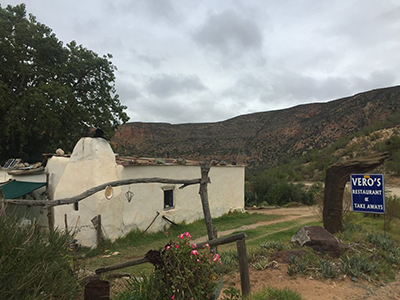 The Baviaanskloof has a tremendous amount of history, including the 17 Italian prisoners of war that lived unsupervised lives in a small cottage instead of being sent to a concentration camp. They spent their days cutting poplars for matchwood. 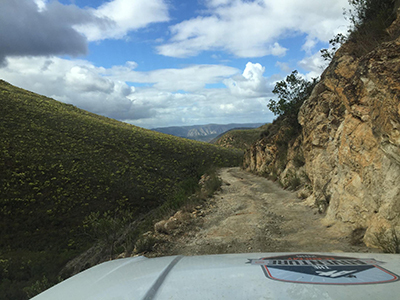 The section we took – the actual BaviaansKloof Route was over 100km. The rock formation and landscape in Baviaanskloof is the result of geological and geomorphological processes operating over the past 500 million years!! We drove through towering cliffs at Eerste water, Oudekloof lichen cliff faces near Prince Albert, bends and folds and zig zag bends. Warm people and welcome Roosterbroed/koek – banting bother!! We stopped at a little pad stall – Vero’s Restaurant and Craft Stall, and had Roosterbrood with jam and cheese, and a strong coffee. Great warm and welcoming people. There were so many different Proteas to behold and the different grasslands and plants, just kept getting more and more beautiful and bountiful as we neared our destination for the night; Zandvlakte Guest Farm. But back to the riders – they were having a terrific time crossing the streams – going backwards and forwards for one another to get that perfect water crossing photo, with the water spraying to the side as they tore through the streams. It was great to see them enjoying themselves so much. Smiles and laughter like little kids on the playground. They were wet already, so why not! The passes we rode through for the day were; Prince Alfred’s Pass, Uniondale Poort, NuweKloof, Baviaanskloof Pass, Die Vlug and Avontuur. We arrived wet and exhausted (the riders not I) at Zandvlakte Guest Farm, and everyone made a beeline for the showers. Oom Piet was a gracious host, and made sure we were warmed up and fed a scrumptious meal. The boots and jackets a little too close to the fires for comfort. We ended the evening off with more laughter and drinks, happy to be dry and cosy. Thank you Oom Piet! We enjoyed our stay. Day 6: After a late night and a great breakfast, we bid farewell to Zandvlakte and head off again for another 320 odd kilometres!! It was still raining, so once again I decided to drive in the Rangie with Martin. We continued through the Baviaanskloof pass, the views constantly delighting both mind and senses. The remarkable amount of flora and diversity of plants, shrubs, succulents and trees is astounding. I was constantly amazed. One definitely needs a few days in the Kloof to explore all that it has to offer – from archeological sites to bird, animal, plant and cultural life. The adventurous riders continued to take delight in the rivers for that extra special photo. I was impressed by the spectacular landscape of canyons, cliffs, rock faces, valleys and rivers. The hair-pin bends – now navigated in a Range Rover with a trailer, were terrifying! I am not sure whether it is better on a bike or in a car. At least the barriers were somewhat more in existence here than on the way down to Die Hel. 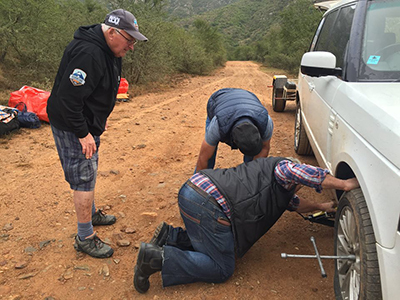 We got a few punctures on the road out of Baviaanskloof, causing the guys to spend a bit of their time waiting for us along the way. Fortunately we made friends at the entrance of the kloof with Adrianne and Mike Robinson, and Ricky and Pieter van Rensburg. They helped us with the first puncture, and then they came across us again when we were hit by the second one. We didn’t have a puncture plug though – now required as the spare tyre was in use. As luck would have it, we flagged down a motorbike, and Morne not only had a plug, but helped us fix it. Thank you so much to Morne and Sonja Vos, Adrianne and Mike Robinson and Ricky and Pieter van Rensburg! You were indeed our Guardian Angles!! If any of you ever find yourselves in need of a hair appointment, when in Oudshoorn, please visit Adrianne at Salon Petite. She is a fabulous lady! We had a very late but delicious lunch at Padlangs in Petensi. 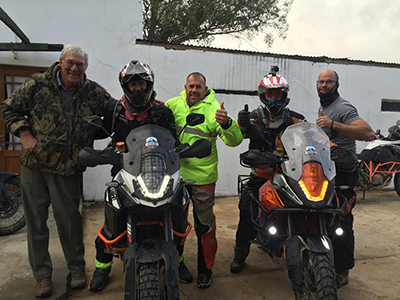 I then took to the back of the bike again, and we started off for our final Karoo destination – Steytlerville, which was still over 250kms away!! Sadly, due to the delays brought about by the punctures, we missed the spectacular sunset from the hotel. The last bit of the journey was done in the dark – which was rather alarming as Kudu and cows meandered happily across the roads. We (or perhaps just me?) were relieved to arrive safely at the quirky Karoo Theatrical Hotel in Steytlerville. The last two days were particularly long, and we were exhausted, but nothing could distract us from the adventure or the beauty of the road. We had a great evening but retired early as we were all so tired. Day 7: The final day of riding on our magnificent adventure! How sad. We left Steytlerville, rode round the back of Addo Elephant Park, and then onto the beautiful Suurberg Pass, passing through Addo. Suurberg Pass started off with a rocky section with loose stones and sand. It was a wonderful pass, even though at one point I lost my mojo a little bit, and wished I could stop and call Uber!! In looking back now, I was so foolish, and I wish I could still be out there on those mountain passes, on the back of the bike with Danny. We stopped for a drink at the graceful Suurberg Mountain Village Hotel – they were only serving a buffet as it was Sunday, so after the drink, we carried on down the pass – which at this stage was simply magnificent! No loose stones or any technical bits. My Mojo returned. Danny and I carried on straight to PE, meeting up with the rest of the gang for a bite at the Beer Shack. 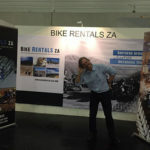 The bikes made quite an impression, and I chatted to two guys who loved the thought of riding through their impressive Eastern Cape countryside on a bike. We stayed at the very special 5th Avenue Beach House, and had dinner at the Blue Waters Cafe – where Craig Anderson popped in to catch up. Thanks Craig! I can honestly say that this trip; Planes, Trains and Motorcycles (PTM) was without a doubt one of the most magnificent and adventurous holidays I have had the good fortune to be a part of. It was a memorable experience which was over all too soon, but one I will never forget. When I hear the sound of a motorbike in the distance, my heartstrings pull and I think of all the beauty I experienced. Thank you to the group; Peter McBride, Martin Davis, Gregory McIntyre, Gary Watson, Warren Garmany, Frik Steynberg, Ockie Fourie, Paul Botha, Robin Borley, Danny Mulder and Andrew Biram. You were the most awesome bunch of people to ride with. Your support and encouragement was much appreciated. I am lucky to have been initiated to the wonderful world of riding by you all. Your patience, sense of humour and joie de vivre, and yet serious responsible natures, made this trip spectacular. The roads, thrilling mountain passes, places we visited and stayed in, would have been empty without the characters of the group. Ant Chapman, you were sorely missed, but never far from our minds. Andrew Biram, thank you for putting together such a terrific adventure. Your planning was phenomenal! You instilled confidence in all of us – especially a novice such as I. You are brilliant at what you do and I wish you every success in the future – I will always recommend you and The Adventure Academy. This trip is not for sissies – your knowledge of the technical passes we have in South Africa is immense, and we will definitely tap into it in the future. Thank you so much. Peter McBride and Martin Davis thank you for your incredible patience in being part of the support team. Knowing the two of you were always nearby certainly added to the confidence I felt in embarking on such a unique and fabulous trip! Farewell all, I am hooked!! I look forward to another glorious adventure. Thank you for all your great comments – it is amazing how they can spur one on. I do love Social Media! !